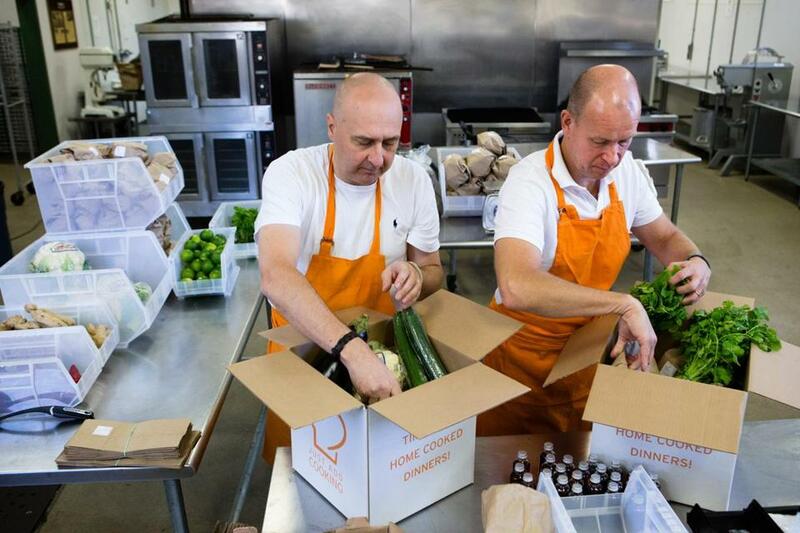 Anders Lindell (left) and Jan Leife, founders of Just Add Cooking, pack up the meal boxes, including spices, at the industrial Crop Circle Kitchen in Jamaica Plain. Let’s face it: Even if you like to cook, and you’ve resolved to cut down on takeout and make more dishes from scratch, doing it night after night after night can become a chore. Maybe not the cooking itself, but the planning and shopping and conceptualizing: coming up with dinners that are tasty, nutritious, family-friendly, and quick to prepare. But don’t touch that speed-dial. A new type of business can bail you out. These companies deliver fresh meal-making kits — complete with protein, produce, and measured-out ingredients — to families who like to cook but prefer to avoid the tedium that surrounds it. They also deliver the promise of enjoying home-cooked meals for minimal effort, the Holy Grail of the dinner hour. Blue Apron, HelloFresh, Plated, and Chefday are among the services that will deliver a meal kit in the Boston area, though each of these businesses is headquartered in New York. New to our region is Just Add Cooking, started by Jan Leife and Anders Lindell, two recent transplants from Sweden (their wives work for biotech company Biogen Idec in Cambridge, and both families raised children). They maintain that theirs is the first Boston-based entry in the fresh-meal-kit-delivery market. It might be tempting to attribute the rise of the meal-kit-delivery business to our big, busy American lifestyles, but Leife reports something surprising. He took his inspiration from a similar service he used back home. “There are about 40 companies offering this in Sweden,” he says. The population there is not much larger than that of New York. He adds that similar businesses are extremely popular throughout Europe. When they arrived here, Leife and Lindell were casting about for new business ideas, and soon hit upon meal-kit delivery, already so successful in other markets. They launched Just Add Cooking last spring and are currently working out of Crop Circle Kitchen, the Jamaica Plain culinary incubator. The variety of dishes offered by the service is impressive, ranging from beef teriyaki to black bean burgers, coq au vin, couscous Marrakech, ratatouille, and sliders. There are vegetarian and fish options, along with meat and chicken. On a recent Saturday morning, Leife and Lindell are busy packing up meals for delivery at Crop Circle. Everything is portioned and measured out. 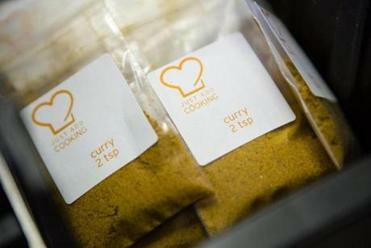 If a meal calls for one teaspoon of curry powder, that amount is poured into a tiny plastic bag and included in the week’s delivery. But the service stops short of actual prep work. Customers must dice onions and chop ginger and so on. Remember what the name says: you’re actually adding cooking. Spice packs that typically come in a delivery from Just Add Cooking. But the proof, of course, is in the pudding — or in the fish tacos or chicken saltimbocca, which are among the Just Add Cooking options. I took a Just Add Cooking meal for a spin to see if it lived up to its promise. The company delivered the ingredients and directions for pork loin Africana. The dish, which cost $8.92 per serving for four servings (priced as part of a three-meal box; the price per meal decreases if customers opt for a larger box), was pork tenderloin cooked in a creamy curry sauce with apple and plantain slices, accompanied by seasoned rice. The concept seemed sound, and the results were quite tasty, but directions were a bit vague and might have been confusing to a novice cook. I chopped an onion, grated an apple, and sliced a plantain; the tenderloin was whole and needed to be sliced and sauteed. Preparing the dish also took me a bit longer than 30 minutes, start to finish. I like a green vegetable with my dinner, so I sauteed some broccoli rabe, but the meal would have been satisfying without it. All in all, it was a good dinner. Even better, it was a dish I probably would never have thought up on my own. Perhaps the most valuable aspect of the service, with its repertoire of 110 recipes and counting, is that it offers a way out of the dinnertime rut.